The native Checkered White was formerly quite common in the mid-Atlantic States, and always a tantalizing possibility in Massachusetts. But why was it so much more frequent here in Scudder’s day than now? This species has undergone a drastic decline in the northeast and mid-Atlantic, and as far south as the Carolinas and Georgia (NatureServe 2011; Wagner 2005: 85; Iftner et al. 1992). The explanation is unknown, but may involve a parasitoid spillover from the introduced Cabbage White (Wagner 2007). Habitat loss is not a plausible explanation in this case, since host plants are common weedy species, and the butterfly frequents dry, weedy waste areas. The Checkered White is still common in western and mid-western states. Prior to 1950 the Checkered White was placed in the same genus as our other whites, Mustard White (Pieris oleracea), West Virginia White (Pieris virginiensis), and Cabbage White (Pieris rapae), but it has now been grouped under Pontia with the Western White. Between 1901 and 1950 there continues to be a trickle of reports of Checkered White in Massachusetts, primarily from eastern and coastal areas. Farquhar (1934) cites specimens from Wollaston (September 5, 1911); Medford (L. W. Swett, around 1908); Forest Hills (July 9, 1910); and Stoneham (C. V. Blackburn, 1920s-30s). There is a Providence, Rhode Island specimen (September 14, 1913) in the Yale Peabody Museum. There are Bristol County reports of a female taken at Westport Harbor 9 September 1940 and a male taken at Fall River 4 October 1943 (W. P. Rogers 1946, cited in MAS Atlas). There are no reports from the well-collected islands of Martha’s Vineyard and Nantucket for the 1930’s or early 1940’s (Jones and Kimball 1943). In the late 1940’s a specimen was reported taken in North Andover by William B. Rogers of the Brooks School (Root and Farquhar 1948). No specimens from Massachusetts of any date seem to be in the Harvard MCZ. There is one Massachusetts specimen in the Yale Peabody Museum, from Springfield, taken by E. A. Chapin, possibly dating from the 1940’s. But between 1950 and the mid-1990's, there appears to be only one record of Checkered White in Massachusetts: a specimen in the collection of Don Adams, taken at Weymouth Naval Air Base on July 16, 1966. The 1986-90 MAS Atlas did not find Checkered White. The first MBC sight and photographic records begin in 1997 (see below). Checkered White was, and may still be, an occasional temporary colonist in the northeast. It could become quite numerous at its summer outposts. Scudder cites one such instance: it was “very common” one year in Brockport, New York, for example (Scudder 1899: 1167). The Connecticut Atlas mentions that it was “somewhat abundant” in 1911 at Avon, Connecticut, and that Charles Remington documented a large breeding population in 1953 in Woodbridge, Connecticut (O’Donnell et al 2007). In general, the species is known to have been cyclical in abundance in most parts of its range (see discussion in Gochfeld and Burger 1997: 128-9). Many early scientists, including Scudder, blamed the decline of the Checkered White on the arrival of the Cabbage White. Competition from the rapidly expanding Cabbage White (Pieris rapae) was blamed for the decline of all three native whites: the Mustard, the West Virginia, and the Checkered. In fact, at the time Scudder was writing, the Checkered White was already being replaced by the Cabbage White in the midwest. C. V. Riley, who was the State Entomologist of Missouri, wrote of Pontia protodice in 1870: “It is the common white butterfly of Missouri,”...”sometimes flitting so thickly around the truck gardens near large cities as to remind one at a distance of the falling of snow. It often proves exceedingly injurious.” But writing again a few years later, Riley says that Pieris rapae had now taken its place. “... indeed it has suffered at the hands of this interloper equally with the nearer relative of the latter, Pieris oleracea” (quoted in Scudder 1889: 1167). But as with the Mustard White and West Virginia White (see those species accounts), it is hard to be precise about just how the competition took place, and examples of present-day coexistence with the Cabbage White suggest that other factors were at play. One explanation put forward by F. Chew for the decline of all three native whites focuses on the explosion of a variety of non-native host plants, to which the native whites were unable to adapt, because the larvae did not survive on them (Chew 1981). The introduced Cabbage White, by contrast, was already adapted to these non-native crucifers, and quickly adapted to native crucifers as well. This explanation might hold for the Checkered White (according to Iftner et al. 1992), but most authors (e.g. Scott 1986) assume that the Checkered White in fact does well on many introduced host plants, and utilizes almost the same range of hosts and disturbed habitats as the Cabbage White. More research on host plant selection and larval survival is needed in the case of Checkered White. The Checkered White is reported to feed on many crucifers---almost any of them, in fact. It’s most often-reported host plants are said to be Virginia Peppergrass (Lepidium virginicum) and Shepherd’s Purse (Capsella bursa-pastoris), as well as cultivated mustards such as cabbage and turnip (Cech 2005; Iftner et al. 1992; Scott 1986; Shapiro 1974). Unlike the Cabbage White, the Checkered White lays its eggs on flower parts, not leaves, and the larvae feed on buds, flowers and fruits. Virginia Peppergrass is probably native to all Massachusetts counties (some writers consider it adventive from Europe), but there are also six other Lepidium species here which are introduced and widespread. Shepherd’s Purse is introduced in Massachusetts, naturalised from Europe, but widespread (Sorrie and Somers 1999; Magee and Ahles 1999). Studies are needed to ascertain larval growth and survival rates on various native and non-native host plants. Checkered White’s habitat is disturbed, open areas such as vacant lots, old fields, railroads, pastures, and vegetable gardens. These are the same habitats preferred by the Cabbage White. Loss of habitat is thus an unlikely cause for the Checkered White's decline---although, as NatureServe remarks, the increase in mowed lawns, asphalt, and forests does not provide habitat either. The widespread availability of seemingly suitable habitat and host plants makes it more likely that some pathogen is involved in the Checkered White decline; perhaps the Cotesia glomerata wasp parasitoid which was imported from Europe beginning in 1884 to control Cabbage Whites, and is now proving lethal to Mustard Whites. Most Cabbage White populations now carry the parasitoid, and are spreading it to native whites (NatureServe 2011; Wagner 2007). Cotesia glomerata has negatively affected Mustard Whites in Massachusetts. After 1950, there appears to be only one report of Checkered White in Massachusetts until the MBC reports in the mid-1990’s. A review of Lepidopterists’ Society Season Summary records 1959-1991 yields no reports. The 1986-90 MAS Atlas did not find the species. There are two reports from Rhode Island in this time period (Benner 2010). MBC reports 2000-2007 rank the species as “Rare” (Table 5). The nine recorded sightings 1992-2013 are shown in Chart 6. The two 2012 reports are: 1 on 8/30/2012, Northampton community gardens, R. and S. Cloutier, and 1 on 10/13/2012, Orleans Pochet Island, W. Petersen. Coastal locations are the most common: earliest four reports shown in Chart 6 are from Westport Gooseberry Neck, at the southern coast, and three of the five recent reports are from Cape Cod (2006 at Wellfleet, 2009 at Provincetown, 2012 at Orleans). In the Berkshires, there were several reports from Pittsfield in July 2006, but they probably represent the same butterfly individual. This individual was the first report from Berkshire County since 1898. It was seen several times by several observers and was reported on the Central Berkshire NABA Count on July 16, 2006. A photo of that individual is shown above; it is also on the MBC website, where it is erroneously dated 7/15/2007. The August 30, 2012 report from Northampton community gardens is the first for the Connecticut river valley since Scudder's time. Nearly all coastal sightings have been seen in late summer: 9/20/1997 (Westport), 9/12/1998 (Westport), 9/10/2000 (Westport), 10/13/2003 (Westport); 8/22/2006 (Wellfleet), and 10/15/2012 (Orleans). But the Pittsfield and Provincetown sightings were in mid-summer (7/16/2006 and 7/14, 2009 respectively), and the Northampton report was 8/30/2012. Two individuals, one from Wellfleet and one from Westport, were reported as females. As far as is known, Checkered White has not recently successfully reproduced in Massachusetts. No temporary colonies have been reported in over 100 years. All sightings have been of single individuals in mid to late summer. The decline of this species in eastern United States is now so great that it cannot be attributed simply to cyclicality (years of scarcity between sporadic large broods). NatureServe (www.NatureServe.org/explorer) (updated July 2011) reports that the major decline in the east “seems to be accelerating and the species is absent most years now in eastern Pennsylvania, southern New Jersey, and Delaware (Schweitzer, pers. obs. 1964 – 2000).” It is also scarce in most of Virginia and the Carolinas. One known New Jersey colony persists and is sometimes even abundant at Newark International Airport; that colony should be protected. For more detail, see the NatureServe website. 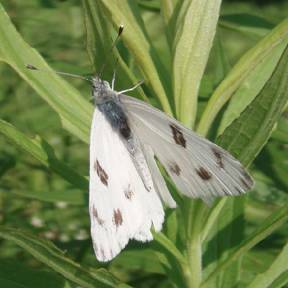 The Checkered White is ranked S1 or critically imperiled in New York and New Jersey, and SH or possibly extirpated in Pennsylvania and Connecticut. It is not ranked in Massachusetts. No state Natural Heritage program east of the Appalachians ranks this species as demonstrably secure, not even Georgia or Florida (NaturServe, accessed 6/23/2010). In Ohio, it has “suffered a dramatic decline” since the 1930’s (Iftner et al. 1992). At the same time, it is almost impossible to protect a species when the cause of decline is unknown, and the species is known to be wide-ranging and cyclical. Given the regional decline, this species will probably remain a rare immigrant in Massachusetts for the foreseeable future.